Designed with a peak to pavement outdoor styling but with all the organizational of a classic Samsonite product. Cargo pockets for exterior organization, integrated shoe pocket, and interior organization. Top grab handles for an alternative carry option. Designed with a minimal styling but with all the organizational needs of the modern executive. Large interior gusset to allow for easy access to organization. Durable yet sleek twill body material with genuine leather accents. Sleek, soft seamed organizational pockets. Quilted neoprene back panel for additional comfort. Custom designed hardware with gun metal finish. Molded feet designed for increased durability and functionality. Duffel bag designed with integrated garment bag feature is the perfect travel companion combining a flat garment bag with the ease and convenience of a travel duffel. Zippered large U-shaped opening to the main compartment with structured front panel that folds away while in garment bag mode allowing it to lay fully flat when unzipped. When completely zipper closed, this bag functions as a carry-on sized duffel. Garment bag feature is sized to hold a large men's suit and extends into the bottom panel of the duffel to allow pants or long dresses to lay flat. Designed for those who work remotely, in coffee shops or other small public spaces. The haul style bottom allows the bag to not tip or slide down. The patent pending smart shelf in the main compartment acts as a sturdy place to prop your phone for video conferences. The smart shelf also divides the main compartment into two separate spaces. Adjustable interior shelf feature is patent pending. Designed to accommodate one-bag-travel, this backpack features a large luggage style compartment, a separate packing cube and amenity pouch, and a pouch to hold your travel documents. 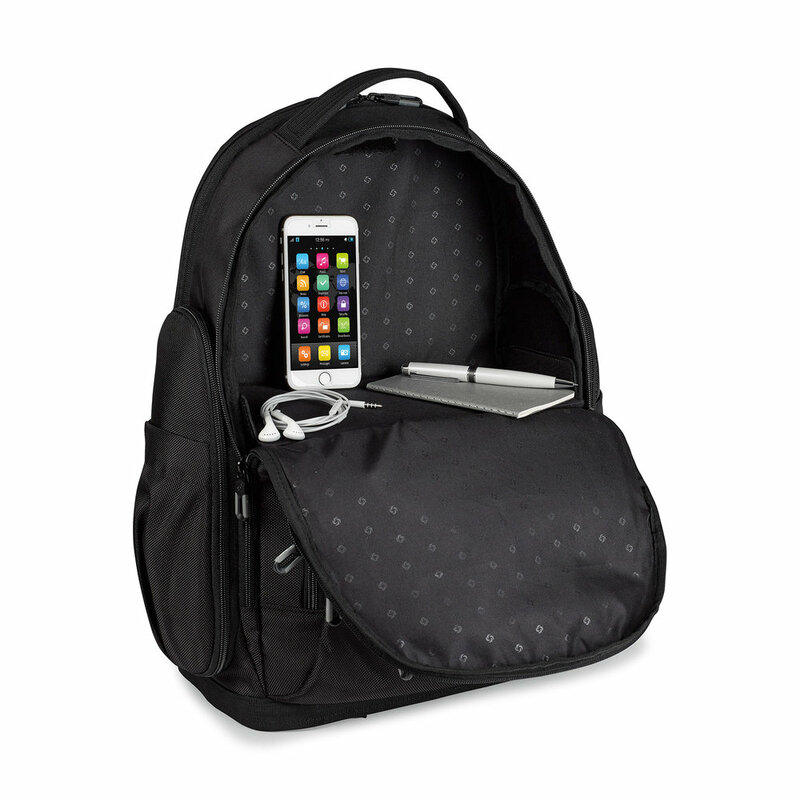 This backpack also features pockets and organization for all the tech items and cords you might need for a short trip. Packing cube, TSA friendly amenity case, and travel document pouch included. Additional organization for tech accessories. Large travel tote with removable amenity pouch. This is a continuation of the existing Xenon 2 line. This tote was designed to fit into the exsisting Xenon collection. Interior organization is well suited for all your tech items.